If side view mirrors are properly adjusted in a car, there are no blind spots on the sides. Such an arrangement can greatly reduce the probability of side swipes and other accidents, particularly in lane changes. This method was first revealed by George Platzer in a 1995 paper presented to the Society of Automotive Engineers. The method is frequently overlooked in driver's education classes, and takes some getting used to. Calculated elimination of blind spots by properly trained drivers is cheap, and obviates the need for expensive technological solutions to that problem, provided drivers take the time to set up and use their mirrors effectively. The arrangement — pointing the side view mirrors substantially outboard in a fixed mechanical formula — is relatively simple to achieve, but it takes some knowledgeable effort. It is reputed to be a lifesaver. However, one source considers that method a driving mistake and claims it to be even more dangerous, because it creates other blind spots directly behind the vehicle—he lists nine reasons, e.g., when backing up—which are impossible to eliminate by a "shoulder check". Of course, rearward invisibility is an entirely different matter. The area directly behind vehicles is the source of Back-up collisions, particularly involving pedestrians, children and objects directly aft of a vehicle. That area has been called a "killing zone." These problems are the object of a number of technological solutions, including (in rough order of technological complexity, simplest first): rear-view mirror, side-view mirror. fresnel lens, sonar, parking sensors and backup camera. A similar problem attaches to positions left and right of a vehicles' rear bumper as the driver attempts to back out of a parking space. Specially designed cross traffic alert warning systems have been developed. An accident caused in part by an A-pillar blind spot. A flatter A-pillar's advantages include reducing the overall drag coefficient and making the car body stronger in a frontal collision, at the expense of reducing driver visibility in a 180° field of view from left to right. A flatter A-pillar (and therefore windscreen) is also a factor when calculating the effects of a collision with a pedestrian. In general a flatter angle will result in a more gentle impact, directing the pedestrian "up and over" rather than directly into the windscreen. This is particularly true for cars like the Mercedes-Benz A-Class which also have a low angled engine cover. An A-pillar that is split up and has a small triangle window (Front Quarter glass) can give a short driver visibility problems. Some cars the windshield is fillet with the roof-line with a big radius. A fillet round A-pillar can give a tall driver visibility problems. Also sometimes the A-pillar can block the driver from seeing motorcyclists. Because there is no roof connection between the A- and B-pillars, the A-pillars of a convertible automobile have to be stronger and even thicker. However, with the top down there are no B or C pillars, improving visibility behind the driver. ^ "Blind spot definition". Thefreedictionary.com. Retrieved 2011-11-13. ^ "Wide-angle driver visibility and safety innovations distinguish Volvo BeeVan Truck Concept". Gizmag.com. 2007-03-09. Retrieved 2011-11-13. ^ a b c """How To Eliminate The Dreaded "Blind Spot. Retrieved August 9, 2013. , which includes good illustrations of vision zones involved in proper adjustment. ^ a b c d e f Jensen, Christopher (August 18, 2009). 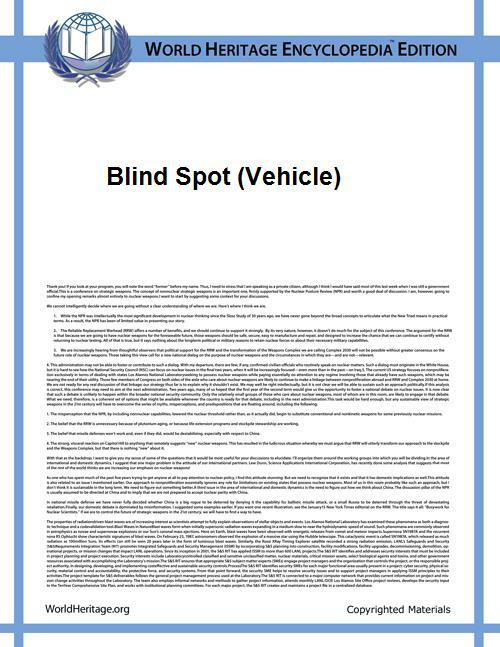 "Are Blind Spots a Myth?". ^ a b c d e Quiroga, Tony; Philpot, Chris, Illustrator (March 2010). "How to Adjust Your Mirrors to Avoid Blind Spots". ^ a b c Pinola, Melanie (December 6, 2011). "Adjust Your Car Mirrors Properly To Avoid Accidents". ^ Wren, Eddie (2003). "Setting Outside Mirrors to the Correct Angle". Driving Myths and Misconceptions. Retrieved January 14, 2015. ^ a b Wren, Eddie, Affiliated: Drive and Stay Alive, Inc. (April 16, 2007). "State Drivers’ Manuals Can Kill Your Kids, SAE Technical Paper 2007-01-0445". Society of Automotive Engineers. ^ "The danger of blind zones The area behind your vehicle can be a killing zone". ^ Camaro - Steve Statham - Google Books. Books.google.com. Retrieved 2011-11-13. ^ "Blindspots and Mirrors". Smart Learner Driving School. 2013-01-20. Retrieved 2014-2-10. ^ "Blind spot offenders named | Auto Express News | News". Auto Express. 2006-08-07. Retrieved 2011-11-13. ^ "State v. Warren Haven". State of Maine. 2002-02-28. Retrieved 2009-10-06. """How To Eliminate The Dreaded "Blind Spot. Retrieved August 9, 2013. Quiroga, Tony; Philpot, Chris, Illustrator (March 2010). "How to Adjust Your Mirrors to Avoid Blind Spots". "Construction Equipment Blind Areas". Highway Work Zone Safety.